AARs, apparently like buses: none, then two come along. 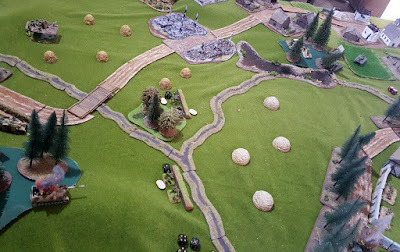 This time would again see the mission Strongpoint Assault played, with two forces chosen from the Fall of the Reich (FOTR) Battlegroup supplement. 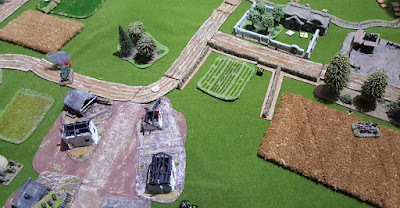 However, this time I would be defending the strongpoint rather than attacking it. 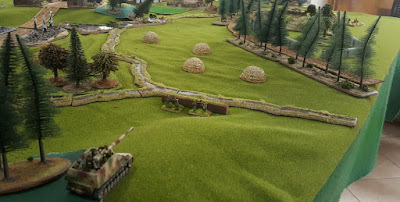 The Germans would field a Forward HQ; a full Volksgrenadier Platoon (Regulars) with Panzerfausts and MG42s; a Volksgrenadier Foot Patrol (scouts); and 8.8cm Flak (in bunker); a single 120mm mortar; a single Nashorn; a Flakpanzer 38t and a platoon of three StuG G.
It's always good to remember the table shot. The Soviets deployed a mob of T-34s, (3x 85mm, 7x 76mm); a PT-34 with mine-roller; FHQ and a Rifle Platoon; a pair of BA-64s; a pair of 120mm Mortars, and some off-table fire support (timed artillery and airstrike). Five units went into the flank attack, the rest started on-table. 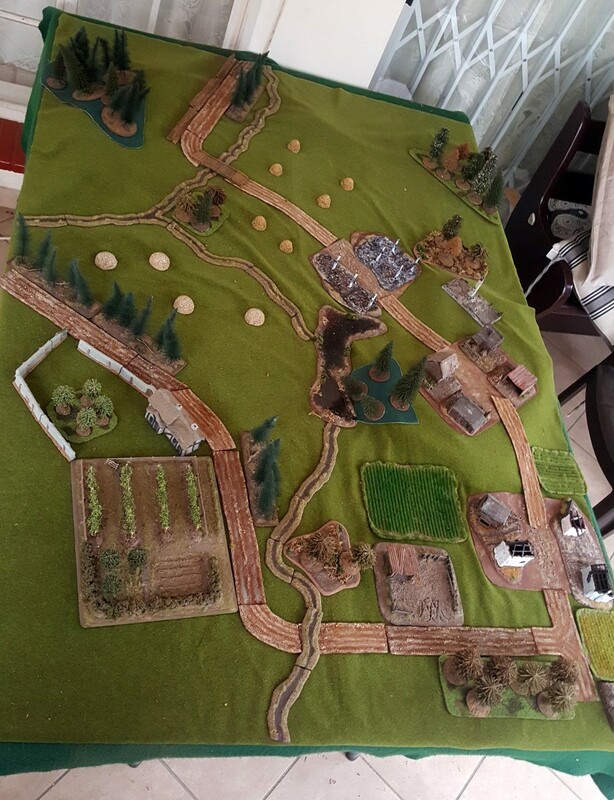 The table, looking from the Soviet deployment edge, before placement of fortifications. 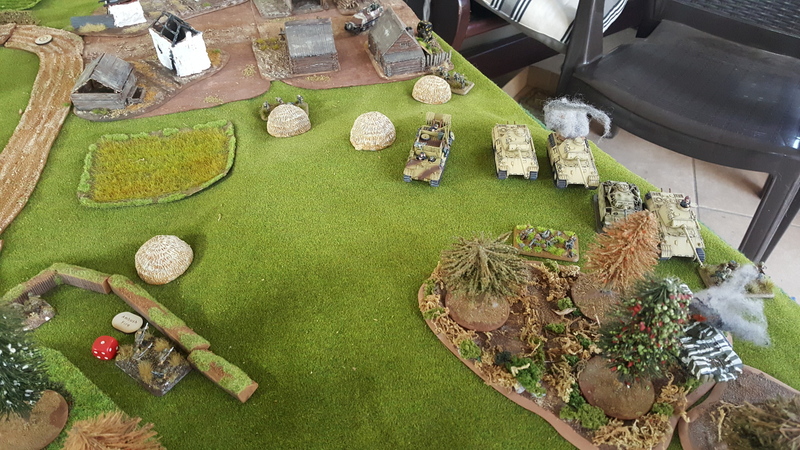 I deployed infantry left and right in trenches, the 120mm mortar to the right-rear, with the Nashorn also on my right and a single StuG on the left. 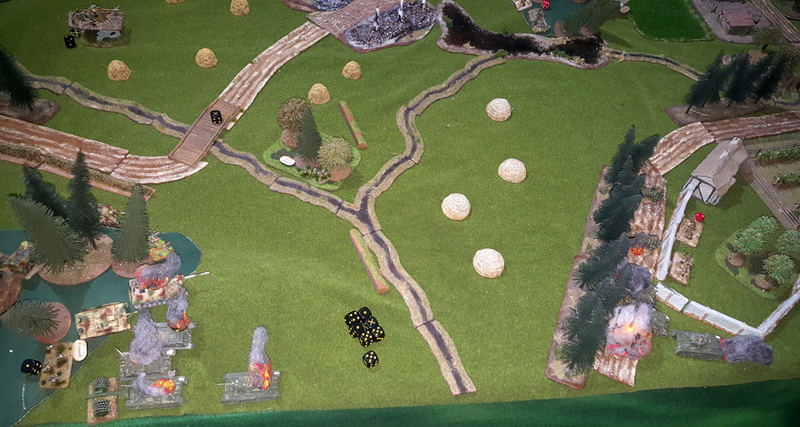 The 88 was in the bunker in the centre with a good field of fire. The rest of the army was in reserve, arriving from turn four. I also rolled a 1 for weather which thanks to rain meant aircraft were grounded: usually good news when you're playing Germans in 1945! The Nashorn surveys the scene. The Soviets, ever masters of "The Plan", appeared to be attempting a double envelopment, though it would later be clear that the main effort would be on their left. The Soviet left advanced with a splutter and roar of engines as the tanks and armoured cars advanced and the infantry "urah-ed" forward aggressively. Most impressive. The left Soviet advance was somewhat less impressive as the lead T-34/76 drove into the sights of the Nashorn who (on Ambush Fire) promptly put an 8.8cm round through his front, with predictable results. 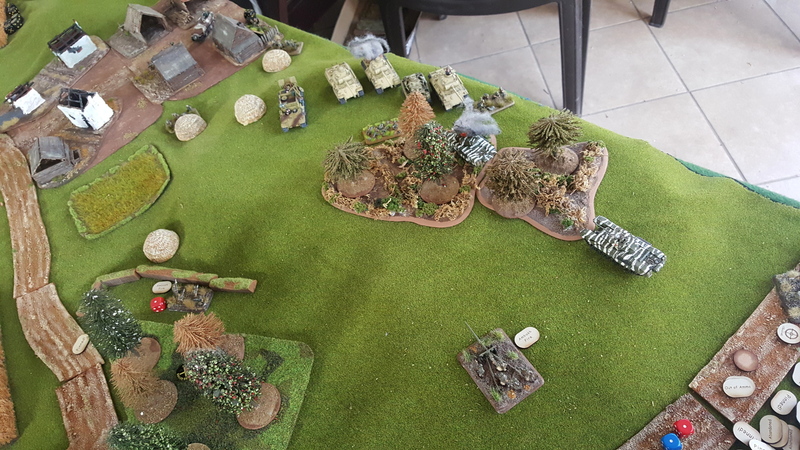 The rightmost T-34 attempted to MG the infantry in trenches but took a Panzefaust hit the face which unfortunately only Pinned him. 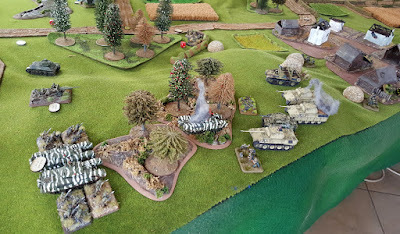 I moved my StuG to take a shot, but missed. 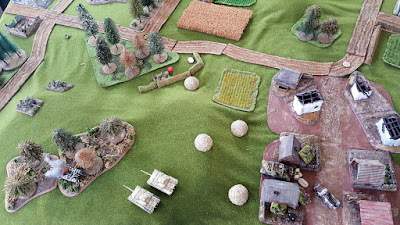 The left advance continued as before as the next T-34 moved into LoS of the Nashorn, fired at him, missed, and was promptly dispatched like his comrade. 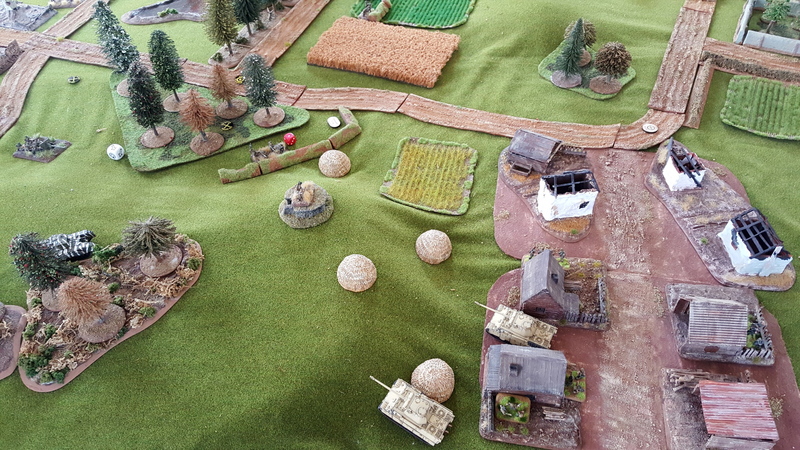 The Soviet right saw the T-34 rally, fire at the StuG, and miss, while the StuG fired back and KO'd the T-34. The supporting infantry took a direct hit from my mortar and the survivors were then lit-up by a pair of MG42s to see them off. So far so good. However, it was not all going to be one-sided: Soviet timed artillery landed on the infantry in the trenches in front of the Nashorn, killing a few infantrymen and pinning two squads, but otherwise doing relatively little. A long-range T-34/85 shot then hit the Nashorn before he could get away, putting an end to him. Sad. 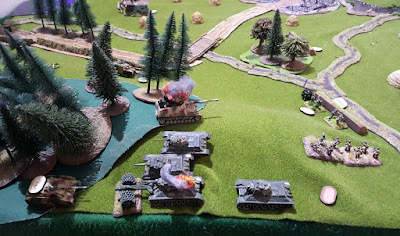 Meanwhile my pair of reserve StuGs had arrived and had time to move into position and go onto Ambush fire for good measure. The 88 took some long-range shots but missed with everything. Farewell Nashorn, we barely knew thee. Turn five: the Soviet flank attack appeared, lead by the PT-34 which was promptly lit-up by StuG on Ambush Fire. Three more T-34s surged on, closing aggressively, hitting the StuG but failing to penetrate the armour, though they did pin him. A solitary Rifle squad accompanied the Soviet tanks, large pom-poms flailing about in support. Flank attack status: hanging in there. 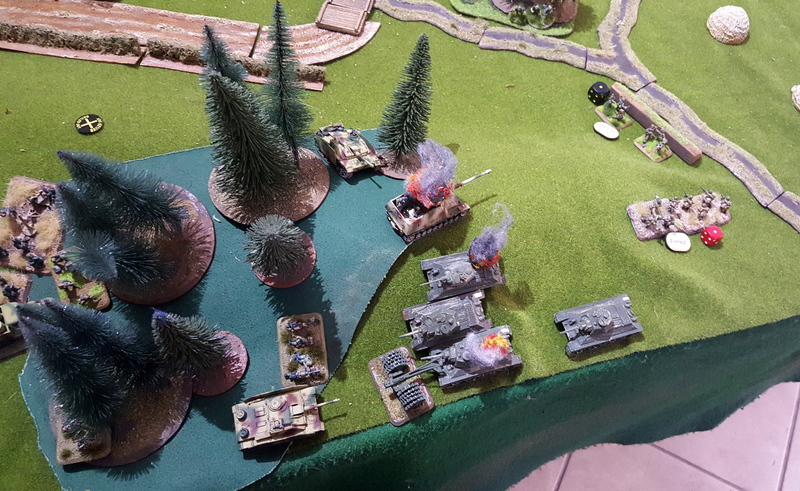 Having weathered the return fire, the right-most StuG dispatched a T-34 while a rifle group dispatched another with a Panzerfaust. An MG42 LMG team eviscerated the Soviet Rifle squad and the flank attack was pretty much annihilated. Flank attack status: ...what bloody flank attack? More long-range fire saw the 88 miss. Everything. Several times. The StuG on the right KO'd the remaining T-34/85 on the Soviet left, as well as a BA-64 who was innocently calling in mortar fire. In return I lost a Rifle group and LMG team to MG fire, but these losses were minor. 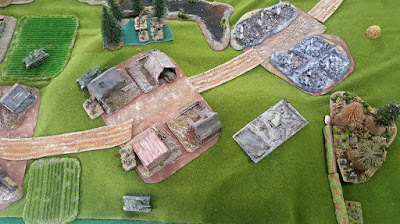 What was left of the Soviet attack switched to their right, the pair of remaining T-34/85s engaging the 88 in the bunker which missed. Them. All. Game. 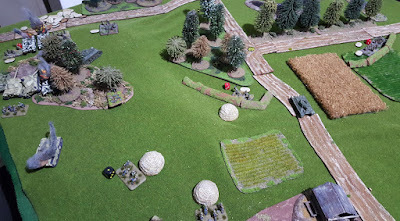 An 85mm HE shot cause a few crew casualties: the 88 gained a Beyond the Call of Duty test, the loader team also sprung into action...and again: They. Missed. With. Everything. Not to worry, for I had a StuG on my left which moved, fired and knocked out the nearest T-34/85 in one sleek motion. With that Soviet morale broke, while having lost 17/40 BR, the Germans clearly held the field: huzzah! If you want something done properly...send a StuG to do it! Rest assured, for their superb performance the StuG crews all received Iron Crosses with Oak Leaves, Diamonds and other very attractive knickknacks. The blind 88 crew were voted "most successful distraction" of the engagement. 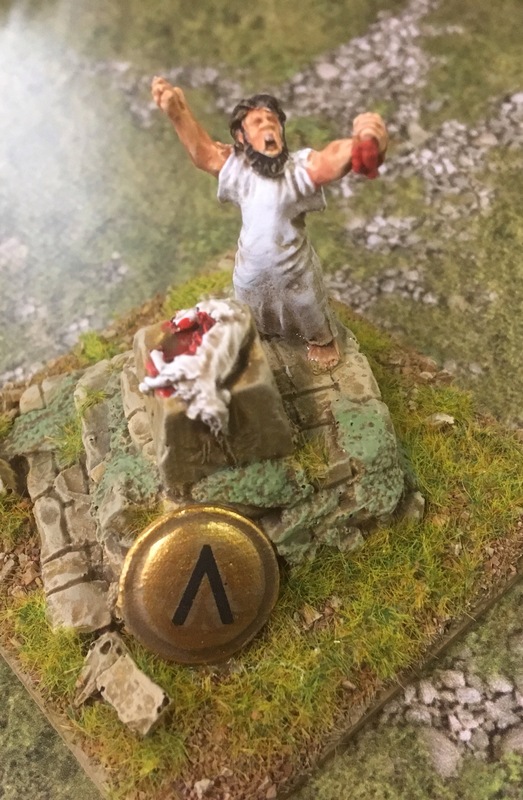 I have been remiss in not putting up any Battlegroup AARs lately, despite playing more and more games using the excellent Battlegroup rules. So, here is one of sorts; a bit haphazard but at least I remembered the camera, even if I forgot to take a picture of the overall table. 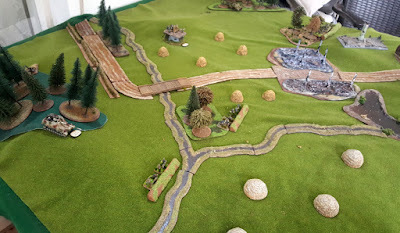 The mission this time was Strongpoint Assault, the gist of it being: a Soviet strongpoint has been identified and my German battlegroup has been tasked with neutralising it. 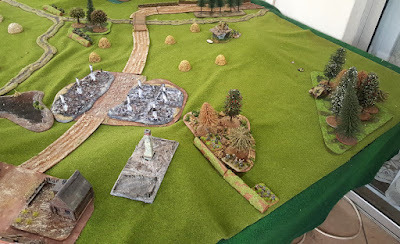 Up to six units could be used as a flank attack, deploying from the middle edge of a table side I had chosen (secretly) beforehand. The rest would deploy on my short edge and attack from there. 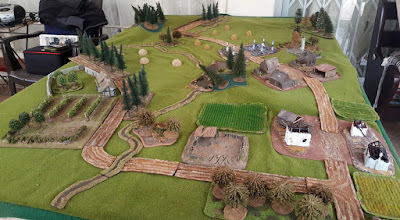 I would be facing a (as I would learn) Soviet force with Infantry in trenches, some wire, a minefield, a platoon of Churchills, another of T-34s, three Zis-3 ATGs (one in a concrete bunker), a BA-10, an OP team in log bunker and a pair of 120mm mortars. 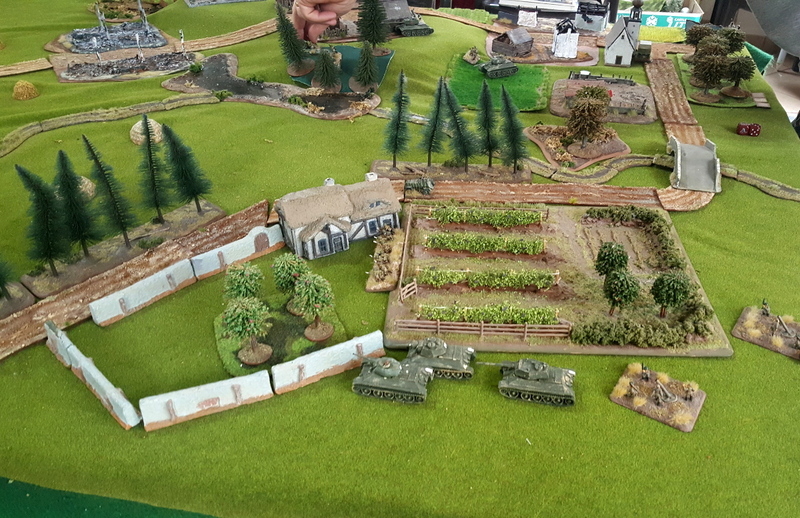 Half the Soviet force wold start in reserves, beginning to arrive from turn four. 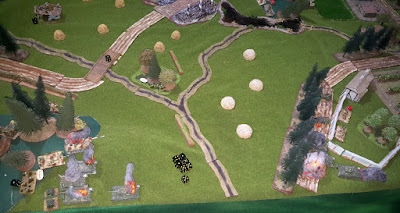 Looking at the table I decided the right was far too obvious a place to attack, so I went left through the village and indicated the flank march to come in on the same flank. 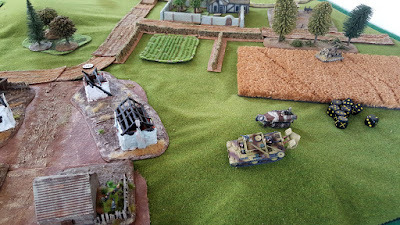 In reserve went a Panther, the Flammpanzer III (first game too! ), an LMG team and three Rifle groups. 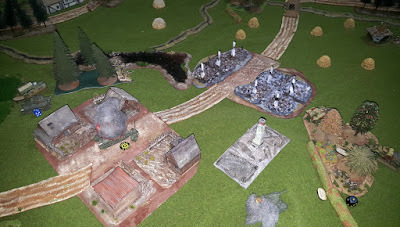 For the first couple of turns I pushed up quite aggressively, losing a 3-man LMG team to a Soviet bombardment on the road just outside the village. 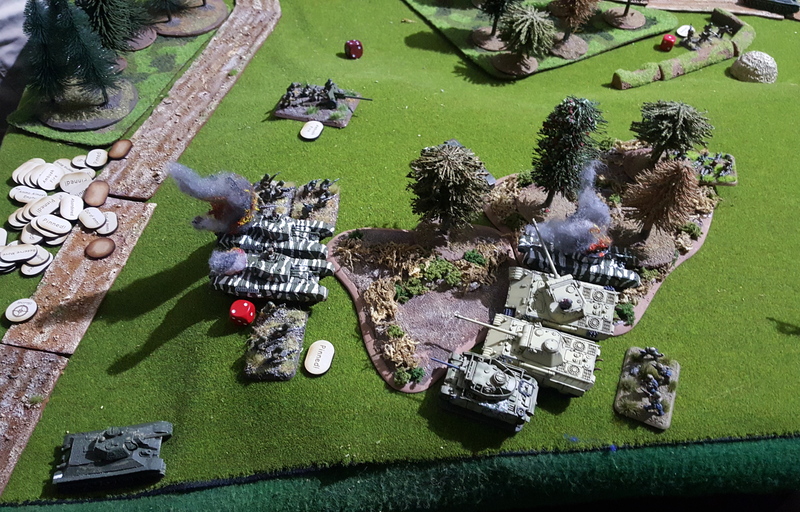 In response, my 15cm Infantry gun managed a couple of direct hits on a Soviet Rifle squad near the crossroads, causing five casualties. 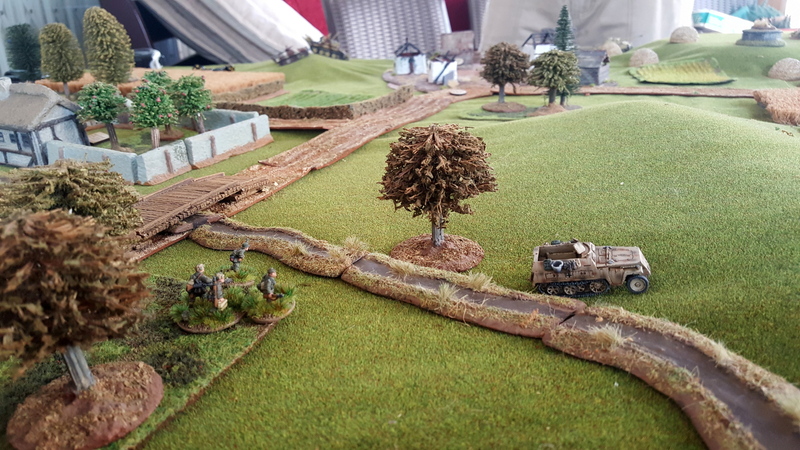 The right flank was held only by a recce group with a Sd Kfz 250 in the meantime. 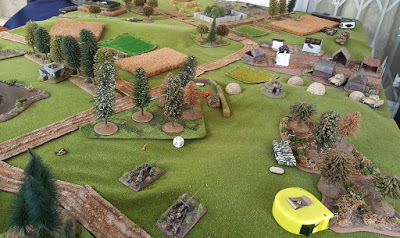 A foolhardy Churchill then attempted a close-range shot on a Panther, missed, and was brewed in return. 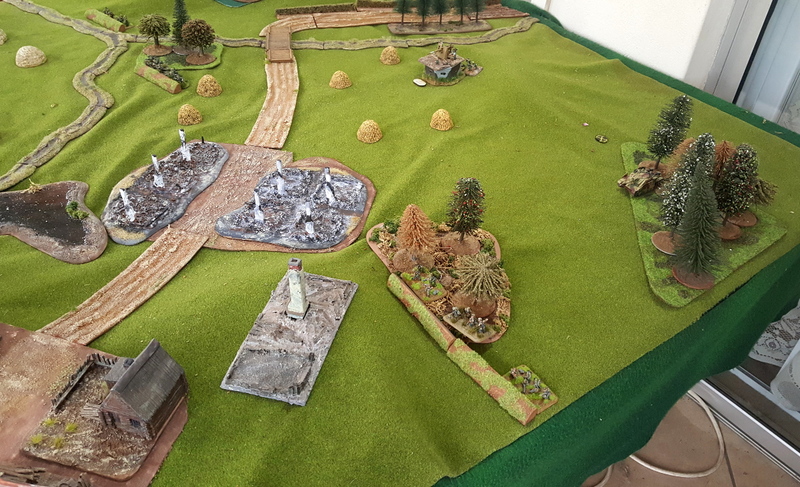 More Mg fire failed to have any effect on the remaining three men of the nearby Soviet rifle squad. 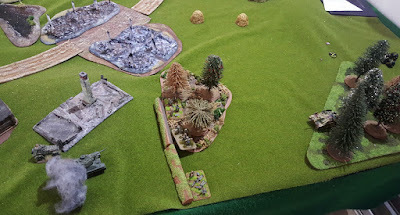 I did, however, manage to clear the Soviet Observer team at the cost of a casualty...by shooting as it turns out, as the initial assault caused only a single loss! However, it was not all one-sided as a 120mm mortar barrage hit both Panthers and KO'd one with a direct hit. Joy. My attack started to slow considerably as no reserves showed up on Turns 3-5 and I struggled for orders. 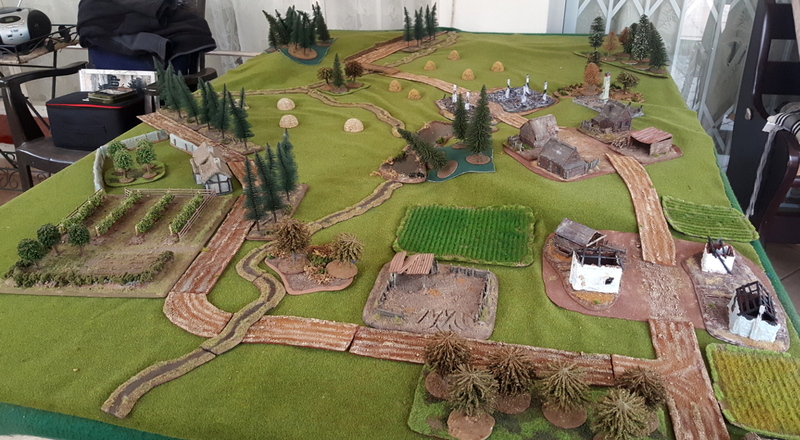 Reserves finally arrived on the table which, with some orders, meant I could get going again. However, Soviet reserves in the form of a couple more Churchills, three T-34s and some more infantry were also arriving. The 250 annoying the flank infantry with some completely ineffectual MG fire. Two turns of poor orders earlier mean I had not got past the wood, and my narrow attack was now being faced down by considerable reinforcements, waiting for me to make the ext move. The wood that was supposed to provide cover was now a severe constraint to my line of sight and movement. What to do? Attack! Both Panthers surged forward, saw 6-pounder rounds from the Churchill (on Ambush Fire) bounce off harmlessly, and KO'd both Churchills. The Flammpanzer also made a contribution, killing 6/8 of the first Soviet rifle squad targeted. A stray 15cm round from the infantry gun also managed to land on top of the Soviet Platoon Commander, removing him from the game. That's more like it. T-34 going on a joyride, no doubt looking to cause mischief at the back. 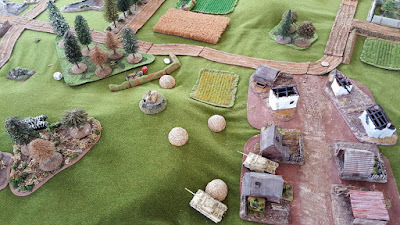 In response the T-34s used their speed to outflank the Panthers, one going far wide down the road in the centre of the table, the other missing a close-range shot on a Panther's flank. The last T-34 hit the Flammpanzer III and though it failed to penetrate the armour, the German crew were none too happy (pinned). In return I stayed stationary and...missed with everything! 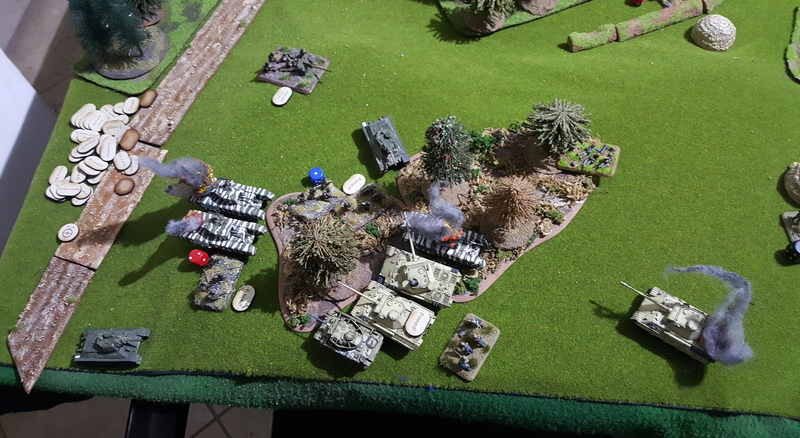 The flanking T-34 then hit both Panthers in the flank, but only succeeded in pinning one! Horrible dice on both sides. The T-34 driving wide on the road then turned inward to engage and hit the pinned Panther, finally managing the penetrate the side armour and destroy it. 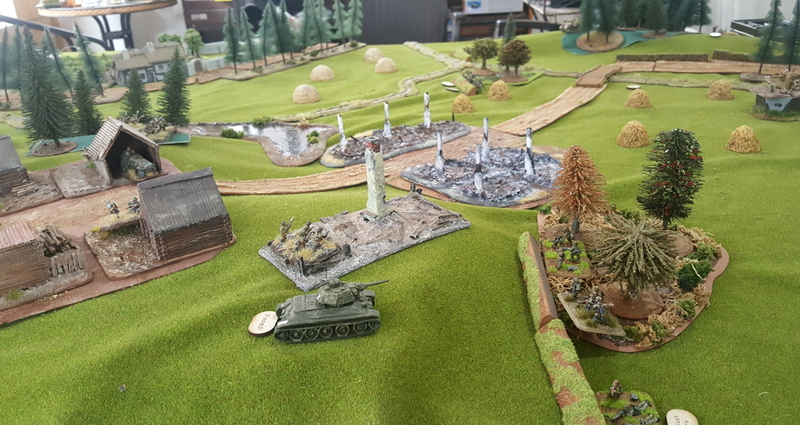 Down to one proper tank and knowing the Soviet force had pulled quite a few chits, I knew I had to force matters to a head quickly as one Panther vs. three T-34s was not going to end well for me. To replace the joyriding T-34, the Soviets sent a BA-10 down the road, again looking to exploit a weak rear area. 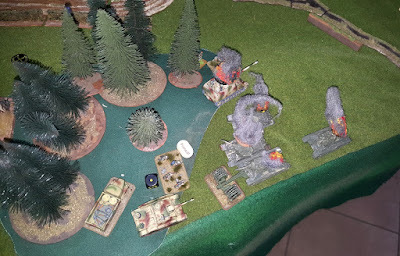 In response I only had the 15cm infantry gun to engage it directly, over open sights, but the dice gods smiled: I rolled a pair of sixes to hit and the BA-10 disintegrated. Soviet morale broke and the Germans, very narrowly, held the field. Double 6s rolled to hit....it solves most problems. Another turn would probably have resulted in the destruction of the last Panther, and my desire to see what the Flammpanzer could do was shown to be a poor choice in this particular game: I lacked an ATG or say a Panzer III to cover the flank of my Panthers and it cost me dearly. I suspected it would, but having never use a flamethrower of any sort I was keen to see what they could do: flamethrowers are extremely potent against infantry. Shoot them first!